The Black stars of Ghana has avoided Nigeria and Cote d’ivoire in the World cup play-offs, according to the FIFA ranking which was released today, the Black stars are ranked second with Cote d’Ivoire first with Nigeria fourth and Algeria on the seventh. Per the rule, the first five teams on the FIFA/coca-cola world ranking will be the top ranked on the play-off table. This mean, Cote d’Ivoire,Ghana, Nigeria, Algeria and Tunisia are the top five and they will play either Egypt, Cameroon, Burkina Faso, Ethiopia or Senegal. 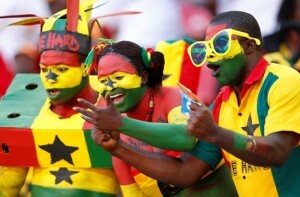 On monday, each team will know which country they will play and wether it will be away first or home first. According to the FIFA rule, the final five teams after the play-offs will earn ticket to the 2014 world in Brazil.